Dubai, UAE, April 09, 2019: This is the watch that every young man dreams of wearing on his wrist: a piece that is passed on from generation to generation. 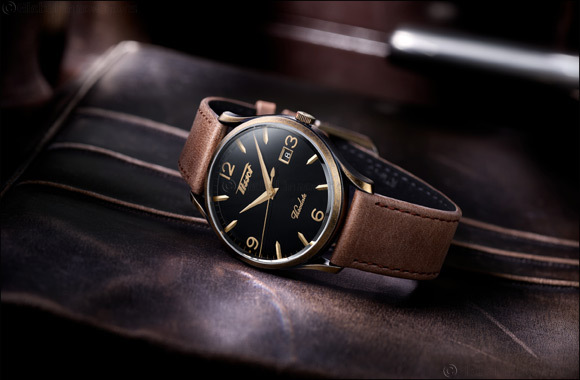 Inspired by the 1950s collection, the Tissot Heritage Visodate Quartz symbolises a smooth combination of sentimental classicism and youthful passion which is expressed in its design: a nostalgic dial with a modern twist, the Tissot logo in the original font, delicate facetted hour markers, the essential date counter at 3 o'clock and – a new feature – a quartz movement. The 1950s heralded the Tissot Heritage Visodate with its avant-garde design: a streamlined dial; crisp, angular lines; finesse in wear; an original style; and the essential date function at 3 o'clock. The Tissot Heritage Visodate Quartz takes inspiration from its predecessor while adding elegant touches from its own time, including a domed case made statelier by a range of distinctive straps. The young man who wears it embodies the values, hopes and aspirations of the 21st century, while showing affection for a piece that makes reference to history. This piece could have belonged to his grandfather, and it possesses a unique patina; but it is also the ideal daily companion. From urban life to the office, from the airport terminal to weekends on the road, the Tissot Heritage Visodate Quartz embodies all the qualities required for the pursuit of purity to which we all aspire. It has that surprising spirit – a blend of retro and modernity – that makes ordinary life extraordinary: a way of reminding us that in life, yes, there is always a new experience somewhere to be discovered. And a new chapter to write.